Young smiling woman groceries shopping in local supermarket. She is standing, holding box and reading nutrition facts. In 1996, the first genetically modified organisms (GMOs) were introduced in Canada. Today, there are more than 81 genetically modified foods approved for sale and use in our food products — but you’d never know from reading their labels. GMOs are plants, animals or microorganisms (e.g. bacteria and fungi) that have had their genetic code altered intentionally by humans. Unlike conventional breeding — selecting for desired traits in a species and breeding through generations — this is genetic engineering in the lab. Essentially, GMOs are created when genes are transferred between organisms that cannot normally breed, creating brand new genetic sequences that do not exist in nature. A well-known example of genetic manipulation is when scientists inserted jellyfish DNA into rabbit embryos while studying hereditary illness, an experiment which made the rabbits glow in the dark. Most genetically modified foods come from engineered plants, created to improve yield, be more resistant to disease or pests, and more tolerant to herbicides or harsh conditions like drought. According to the World Health Organization, future genetic modification could be directed at making food more nutritious, reducing exposure to allergens and improving the efficiency of food production. Most genetically modified crops are used for animal feed, which, in turn, enter the food system through our meat, dairy and egg products. But GMOs are also found in almost 75 per cent of our processed foods, in everything from chips to soda. Health Canada is responsible for monitoring all GMOs entering the Canadian marketplace and states that it is not aware of any evidence that suggests that genetically modified foods are unsafe for us to eat. However, Giroux remains skeptical of GMO safety, and concerns from the public still remain. In a U.S. survey polling the public and scientists from the American Association for the Advancement of Science, subjects were asked whether they “think it is generally safe or unsafe to eat genetically modified foods.” Only 37 per cent of the public reported feeling “generally safe” about these foods compared to 88 per cent of scientists. Canada is the world’s fourth-largest producer of genetically modified crops and grows more than 27 million acres of canola, corn, soybeans, sugar beets and alfalfa. Canada is also the first country to approve the world’s first and only genetically engineered animal for human consumption. One biotech company sold more than 4.5 tonnes of genetically modified Atlantic salmon in Canada in 2018, but since GMOs are not labelled in Canada, it’s difficult for consumers to know whether they’re buying this particular fish. There are 64 countries around the world that mandate the labelling of GMO foods, and some European countries have moved to ban them altogether. 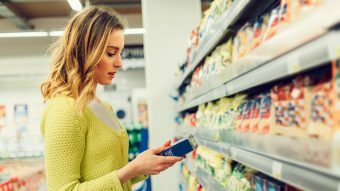 While the Canadian government does not require foods to be labelled, more than 88 per cent of Canadians are in favour of labelling GMO products so they can be better informed. 80 per cent of the world’s genetically modified crops are engineered so they can survive being sprayed with herbicides, allowing competing weeds to die and increasing yields — at least, in theory. As herbicide-resistant weeds have sprouted up, farmers have increased the amount of herbicide they use just to keep yields steady. Since the introduction of genetically modified crops, herbicide sales have increased by almost 200 per cent in Canada. Traces of these chemicals end up in the food we eat. Between 2015 and 2016, the Canadian Food Inspection Agency found nearly one third of tested food samples contained glyphosate residues, the key ingredient of many herbicide products. The federal government of Canada considers these traces safe if they don’t exceed certain limits, and the U.S. Environmental Protection Agency and European Food Authority agree. However, the American Cancer Society places glyphosate on a list of “probable carcinogens,” and some activists, as shown in Modified, are concerned about concentrations in water and our bodies. For Canadians who want to avoid GMOs, the lack of labelling is a challenge and involves some guesswork. The Canadian Biotechnology Action Network, a group of 16 organizations that “monitors and raises awareness about issues relating to genetic engineering in food and farming,” suggests avoiding certain foods, including farmed salmon and processed food with corn, canola and soy ingredients. Meanwhile, consumers can seek out products labelled “organic” or that feature the Canada Organic logo (these must adhere to the Canadian Organic Standards, which prohibit the use of products and materials from genetic engineering).